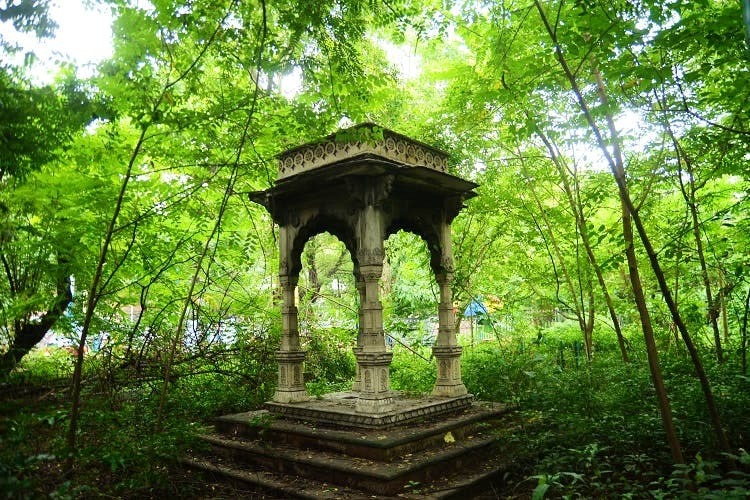 These gorgeous abandoned monuments will remind you that Kolkata is so much more than Victoria Memorial (which will always be our one true love, though). Opposite the Town Hall near the High Court inside the West Bengal State Legislature grounds, this Neo-Gothic monument commemorates Sir William Fraser McDonell. A member of the Indian Civil Service, he received the Victoria Cross for “great coolness and bravery” (which is on display in the Lord Ashcroft Gallery at the Imperial War Museum, London) for saving 35 members of the British Troops from the “incessant enemy fire” that showered down on their boat during the retreat of the from Arrah. The drinking fountain has a lion’s head as a spout and a brass trough at the base. You can still see the dates 1850 and 1886, the period between which McDonell served in India. Today, the monument is unfortunately in a deplorable state with its identifying markers fading away into nothingness. Part of the carved lion spout is broken and the water has long run dry. The railing around it is even used by locals to dry their laundry. The fountain was inspired by Demetrius Panioty, a member of the Panioty family who had moved to India from Greece as traders back in 1750. Panioty, who wrote for the Bengal Secretariat, later became Assistant Private Secretary to Governor General Ripon and several of his successors. In 1895, three years after his death, out of fondness for the man and his dedication to service, Lord Curzon had this marble drinking water fountain installed. You can find this now dilapidated monument near Curzon Park Bus Stop, just opposite of Esplanade Mansion. You’ll have to hunt around the north-west corner of Surendra Nath Banerjee Park (now renamed as ‘Bhasha Uddyan’). It’s complicated to find because it is surrounded by an unkept garden and is unidentifiable (there isn’t even a plaque for this heritage monument!). Yes, Bangalis fought a war, World War I no less. This marble monument in College Square is in memory of the 49th Bengali Regiment, a regiment of Bengali bhadrolok deployed to fight in Mesopotamia, which they did with the hope that ‘self rule’ would come to Indians if the war ended. Spot this memorial at the entrance of the east gate of College Square (you can hardly see it through the posters and the usual line of clothes drying around it). This is supposed to be among the oldest existing buildings in Kolkata. The House is named afer Robert Clive who spent many years in the 1700s here. There are several legends surrounding Clive House – that it was built in a single night, and that both the house and the gardens are haunted. It was in fairly good shape until the 1900s when parts of it started breaking off. In 2001, excavations found remnants of a 2,000-year-old civilisation on the site. Today the House is surrounded by apartment buildings and modern architecture. It is a protected monument under the Archaeological Survey of India but is still largely ignored - chunks of the building still crumble to the ground! This memorial in Chakraberia Road (South) in remembrance of the heroic acts of Nafar Chandra Kundu. At the age of 26 in May 1907, Kundu, an ordinary citizen, risked his own life by descending into a manhole to save two sewage workers who were trapped in a manhole. A simple pillar has details of the incident inscribed on it highlighting the heroic act of a Hindu man sacrificing his life for Muslims back in 1907. What’s awesome is that the monument was built by raising funds from the public. You will barely notice the memorial today amongst the rush of traffic and chaos.